Astronomers at Yale and Harvard have found a galaxy with a heartbeat — and they’ve taken its pulse. It is the first time scientists have measured the effect that pulsating, older red stars have on the light of their surrounding galaxy. The findings are published in the Nov. 16 online edition of the journal Nature. “We tend to think of galaxies as steady beacons in the sky, but they are actually ‘shimmering’ due to all the giant, pulsating stars in them,” said Pieter van Dokkum, the Sol Goldman Professor and chair of astronomy at Yale, and co-author of the study. Later in life, stars like our Sun undergo significant changes. They become very bright and swell up to an enormous size, swallowing any planets within a radius roughly equivalent to Earth’s distance from the Sun. Near the end of their lifetime, they begin to pulsate, increasing and decreasing their brightness every few hundred days. In our Milky Way galaxy, many stars are known to be in this phase. Until now, no one had considered the effects of these stars on the light coming from more distant galaxies. In distant galaxies the light of each pulsating star is mixed with the light of many more stars that do not vary in brightness. The researchers used a unique series of images of the galaxy M87, in the constellation Virgo, taken with the Hubble Space Telescope over the course of three months in 2006. 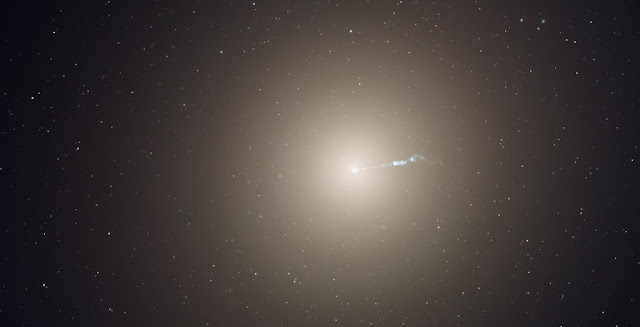 They quickly found what they were looking for: 25% of the pixels in the Hubble image of M87 go up and down in brightness, as if the galaxy had a heartbeat. The mean pulse of the stars in M87 is about one beat every 270 days. The next step, according to the researchers, is to take the pulse of other galaxies. “Our models suggest that the pulsations will be stronger in younger galaxies, and that’s something we’d love to test,” said co-author Jieun Choi, a Harvard graduate student.